The flower sellers usually smile and say, “That was Princess Angeline.” If the tourist was from the Puget Sound, they smile, or get very pale. People from out of town just look puzzled, until the merchant explains that Princess Angeline died over a hundred years ago. 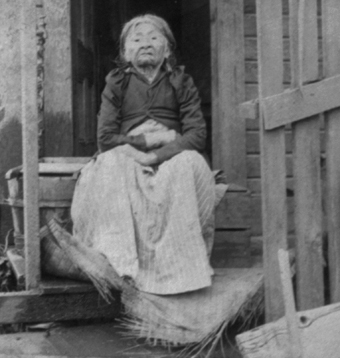 In the 1850s, when Angeline was in her mid-30s, the U.S. Government ordered the Suquamish Indians to a reservation, far away from their homes in Seattle. Angeline stayed on. People started calling her Princess Angeline, because of her father, Chief Seattle, as well as her own dignified bearing despite her situation. Princess Angeline and a handful of other Native Americans found work in Seattle, and lived in various places. She had a small cabin on Western Avenue, between Pike and Pine Streets. To make a living, Angeline did laundry for the settlers, and sold various native handicrafts, like baskets she made in the evenings. As she grew older, Angeline developed arthritis, but kept to her routines. For years, people watched her familiar figure walking along Seattle’s Streets. She always wore a red handkerchief over her head, as well as a shawl to keep out the cold. Her arthritis was so bad in the wet climate that Angeline eventually needed a cane. She stopped frequently to rest, and as she did so, people saw her “telling” her beads, because Angeline converted to Catholicism in her youth. She was tough as well as dignified. Sometimes small boys followed her around, and when they got too close Angeline warned them off by throwing a rock or two in their direction. Not that she knew it, but Angeline became world famous, and many newspapers published articles, and books on her, as well as her famous father. The two of them bridged the time between the end of the Native American lifestyle and the coming of the whites. Angeline died in 1896, and was given a magnificent funeral in Seattle’s Church of Our Lady of Good Help. Her coffin, which was shaped like a canoe, was buried near Henry Yesler (who nobody but Angeline seemed to like,) in Lake View Cemetery. Over the years, Angeline’s cabin was torn down, and the area just became part of the waterfront, until Pike Place Market was formed. The market quickly expanded, and the flower market was built on top of, or very near the site of her cabin. No one knows when, but people began seeing a little old Indian lady, quietly sitting on the floor, with several baskets at her feet. Some of the older people claimed they recognized her as Princess Angeline from popular photographs. People told stories of the many sightings of Angeline over the years, to the present day. 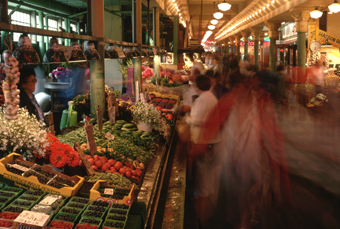 Most of the time she seems confined to Pike Place Market, near the flower market. Some people reported seeing her in the lower levels, leaning against a pillar. Almost everyone who saw her thought that she was a living person, though oddly dressed, her apparition looked so natural. They only found she was not alive, when they went to talk to her, or to ask to take a picture, then she vanished. Recently some people reported that she glowed with a strange light. Even more odd, at least one person reported seeing her outside of the Pike Place Market. The Seattle to Bainbridge Island ferry dock is not too far away from Pike Place Market. In addition to cars, many people travel to the island on foot. Some of them reported seeing an elderly Native American woman hobbling onto the ferry, with the aid of a cane. Once aboard, the woman walks over to one of the benches overlooking the Puget Sound, and sits down. 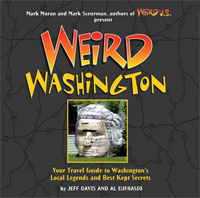 People observing the strange old lady have reported that she vanished before the ferry reached Bainbridge Island. And they never saw her walk off the ferry when it docked. Some people believe that Princess Angeline has been looking for a new home. Some time ago, some of the shop owners brought in a shaman, who attempted to exorcise any spirits at Pike Place Market. Perhaps the shaman was not able to remove her completely, but she now feels unwelcome, and is attempting to find a nicer home.